I’m interested in probability. Not in how we calculate probability, because once you know how to do it, the whole thing can get pretty boring. But what probability is – that’s what I wonder about. Does it really exist? Or is it more like time, in the sense that it’s a way of measuring something we can’t quite put our finger on? And if it does exist, how does it work? My introduction to the subject was likely similar to yours. My math teacher asked a question about colored marbles, and what would happen if you chose one at random. Apparently, this crucial need for a green marble continued, yet we stubbornly refused to look into the box to find it. Then, just as I was growing tired of the teacher’s lack of critical thinking skills, she went on to a new lesson. Now she had my attention. Flipping coins had to be similar, at least in principle, to flipping cards. So, unlike the blind plucking of marbles from a box, here was a skill with real-life applications. My friends and I all collected baseball cards. I use the word collected, but I don’t mean it in any organized, intelligent way. I mean we spent every nickel we had buying more and more packs of cards, hoarding them as though we were somehow enriched by their sheer number. Baseball cards weren’t sold over the winter. The day they reappeared, usually in late March, we all ran like mad to the nearest store, moving as fast as possible while also keeping our legs as straight as we could, so the money jingling in our pockets wouldn’t spill onto the street. We were racing to see what this year’s cards would look like, and getting there ahead of everyone else meant you might have entire seconds to savor that discovery of vital information. Minutes later, we’d stand on the sidewalk right outside the store and open pack after pack, rifling through each one to see which players we got, and how many. Like mindless machines, with each newly opened pack we’d shove another thin slab of brittle, powdered pink bubble gum into our already engorged mouths, all the while attempting to announce our latest acquisitions – at least the ones that would make the others insane with jealousy – and half-listening to their announcements, too. Whenever I see the way stock market traders behave, screaming and biting and climbing over each other, it reminds me of those first days of baseball card season. By summer, we’d each be walking around with a stack, sorted either by team or favorite players, with doubles and triples arranged together and ready for some high-pressure transaction. We’d show off our riches the way gangsters in movies would flaunt wads of money as they paid for a thirty-cent cup of coffee with a fifty-dollar bill. By the All-Star Break, we’d each have a shoebox filled with our most prized cards, which we stashed under a bed or hid in our closet behind the sweaters. The stack we carried around was for trading, or flipping. The front of a baseball card had a picture of the player, his position on the field, and the name of his team. That was heads. On the back of the card were his career statistics, along with some useless trivia, such as “In the off-season, Hector trains pigeons.” That was tails. We’d hold the card by its opposite vertical edges. Then, with our hand down and to the side, we’d pull back, then forward, letting the card meet air resistance as it twirled to the ground. 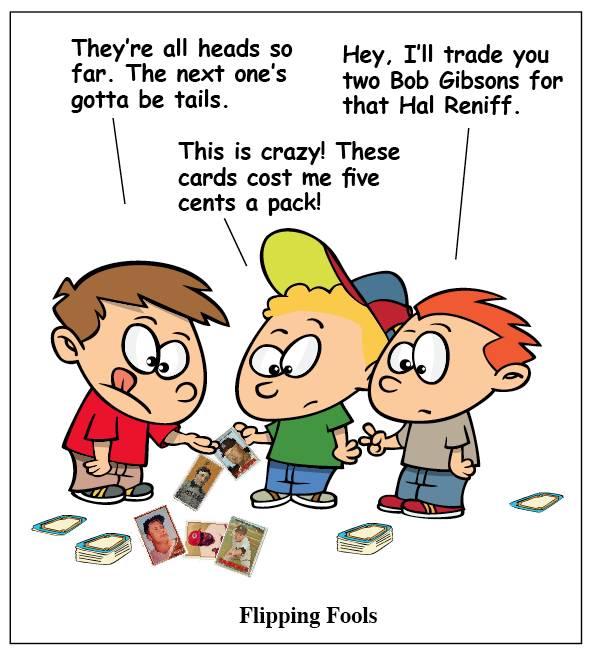 Heads beat tails, while two heads or two tails was a tie, and called for another flip. The winner picked up all the cards. But was there a technique? Could we control the outcome of a flip, or was it just luck? Was probability influencing how much our stack of cards would grow or shrink by the end of the day? And if it all came down to just chance, why did some kids do so well, while others kept getting wiped out? 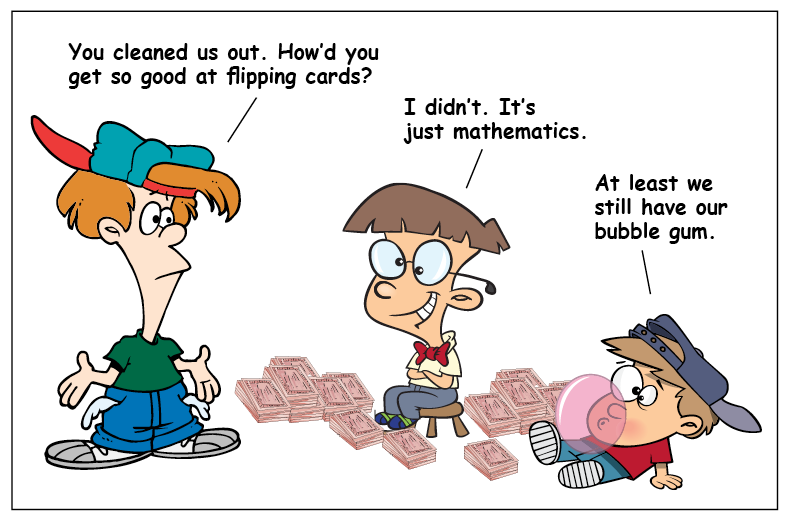 I eventually learned that, in the case of things like coins and cards, probability was a way to estimate how frequently a certain outcome would occur – not predict what would happen at any given moment. But it wasn’t really luck. It was that the object we were tossing was subject to so many competing forces, we couldn’t possibly measure them. In the case of a penny, there was the way we held it before the flip, the angle, how much energy we imparted with our thumb, air resistance, the surface it landed on, and other things. If we were flipping a manhole cover, we could easily forecast the result because the object is large and heavy, making those forces less significant. In other words, it would be simple to control whether it came up heads or tails. If we could shrink ourselves down, so a penny was like a manhole cover, we wouldn’t need probability. Is that what’s going on with everything? We used to attribute almost all events to the decisions of the gods. Then science came along and showed us that some things we thought were mysterious and supernatural are open to understanding, if we’re willing to learn. But there’s still a lot that’s fuzzy. Think of those numbered ping-pong balls that used to determine the next lottery millionaire. Which numbers were drawn depended on thousands of tiny variations in motion, with each variation affecting the others around it, and with everything happening very quickly. No matter how sensitive or smart our instruments may become, things like that will remain unpredictable. But what about the human element? Different people have different skills. We make decisions, sometimes for no discernible reason. Our ability to interact is unprecedented. Add randomness to the mix and almost any crazy thing can happen. You might even be kidnapped and forced at gunpoint to choose a marble from a box. Let’s just hope it’s green. In crushing news, the trend in early probability word problems now seems to be socks. Yes, you are in some set of dire circumstances where your only salvation is pulling a red sock out of a drawer of multi-colored socks. Of course, looking at the socks is absolutely out of the question. Nope, you’re going in blind, and you better not mess it up…or else. I’m familiar with the sock-in-the-dark problems, too. I think these questions are written by someone who lives in a deep cave, or at the South Pole. Actually, though, I’ve published a math book, and I wrote a variation on the sock problem myself. It’s about shoes, which has the added element of a wearable pair needing a right and a left. So maybe I should shut up. The gross gum was the best part. I don’t think I ever spoke up. The light tends to come on in my head about forty-five years too late, which is why I’m just getting around to writing about many of these childhood events. It’s probably just as well. Some of those nuns did have a short fuse. That’s why I said it can get boring. Or maybe it’s too complicated, so we lose interest. Yes, there will be a Part 2. I don’t know about three. Maybe. All of these possible variables. . .this is exactly why it takes me so damn long to do my monthly budget. I freaking love hearing about your baseball cards. Being a non-sports girl, I missed all that. Fantastic post, as always. I love your writing. I’ve tried doing a monthly budget about a hundred times, and it’s never worked. Not once. By the way, have you seen my baseball cards? They were here a minute ago. This is why i hated maths in school. My hatred stands vindicated. You and kasturika should start a club. The I Hate Maths Club. The last paragraph made me think of George Bailey and the fact that we ARE all different in so many distinct ways, and everything we do can change so many factors. I realize that most people tend to do things in ordinary and predictable ways, but any one seemingly small decision, can change the outcome of someone else’s life. I find that fascinating! It does make for a Wonderful Life. The other piece is that when we make a decision, we often have no way of knowing what’s changed, and what would have happened had we decided differently. That’s the problem with those theories about parallel universes — there would have to be an infinite number of them. I love the way your mind works — getting right to the heart of the matter in questioning why you wouldn’t just open your eyes to pick the stupid green marble! But I’ve always been intrigued by probability and luck — for instance, my friend Kate and sister-in-law Jean have an astonishing aptitude for winning things. Jean enters a lot of contests, which explains a lot, but she’s won TVs, microwaves — and a truck. Seriously. Kate wins every door prize at almost every event she goes to … and I, needless to say, never win anything (I did win a t-shirt at a concert once, come to think of it). So yeah. It’s fascinating … lovely thought-provoking post … as usual! Some people do seem to have more good luck — and others have more bad luck. I’m going to talk about that in the next part. It’s an unnerving thing to think about, isn’t it? This idea that we exist as a result of thousands of seemingly insignificant decisions and circumstances, and that changing any one of them would have prevented our existence. Thank you for your consistently thoughtful and kind comments, cat. Will you be writing some of those family stories on your blog? I think that the fact that other folks don’t open their eyes and look before choosing shows that we, the ones who do, are probably the smarter ones. Maybe it wasn’t a math lesson at all. Maybe they were trying to teach us that if we don’t look before we leap, we’re probably going to land in a puddle — or at the bottom of a cliff. I’m a closet statistics / probability fan as well. Still, even though I know that every coin toss has 50/50 chance of coming up either heads or tails, when I toss, say, three or four heads in a row, I’m convinced there’s now a better shot of the next flip being tails. There isn’t, of course, which I guess is why my “intuition” so often seems to lead me astray (i.e. missing the “hard” science in favour of “apparent” common sense). Great post. I think there’s a significant probability that part two will be just as enjoyable! Yvette: Your mother’s skill could be used to generate some income, especially in a city the size of Canberra. Has she considered it? Hahahah my mother is as honest as they come, and she doesn’t even swear. Ever. (well, except when reciting what some little brat at school – she is a teacher – said to her. i.e. ” he told me to f*** off” which actually sounds hilarious when she says it). And she lives on the Gold Coast – probably an even better place to make money on the heads/tail flipping scam. hehe. The laws of probability are completely beyond me, but possibly not beyond the birds in my garden to whom it is most probably that blueblue will get the yellow suet pellet even though it has been thrown for dunnocky dunnock. I missed out on baseball cards. Possibly because we didn’t have baseball here. I didn’t miss out on chimpanzees dressed up for tea at the London Zoo – all of which is and was quite wrong in so many ways, but was great on picture cards that came with a certain brand of tea. I think I had the set. Poor chimps. These days, there’s probably no more reason to dress the chimps up, is there? With your skills at Photoshop, you could put any kind of costume on any kind of animal, without ever leaving your desk. Charles, a random thought without any basis in logic or practical reasoning entered my head as I was reading this post – I wonder what it would’ve been like to know you as a child. – what with all the baseball card mania, fixation on keys and general childhood angst. Whatever it is, I’m glad for it, since it makes for wonderful posts decades later. I’ve wondered that myself, Susan. I imagine we all distort memories, either consciously or not, so that things make sense or fit in with our general impression of how things were. Sometimes I wish we’d had the ability to record everything that happened, the way so many people do today. Then again, maybe it’s just as well that we didn’t. Um………..30%? Geez, I hate math. WHo CARES if you pick a green marble or a blue one. Is it 30%? The problem with math is that it makes no sense in the real world. If you put the equation 1+1=? to a human with no idea of math, the answer is 1. One man, one woman equals one baby. If you ask a biologist, like me, what 1+1 equals, I’m going to ask: what genus and species? If it’s a human, the answer is still 1, but can be 1, 3, and with a lot of help, 6, 7 and even litters of 8. Or if we’re talking termites, it’s one male and one female termite, and you get: hundreds of thousands of baby termites over a period of thirty years. If it’s bacteria? you don’t need 1 plus 1. You just need one bacterium, and very soon (a day), you wind up with millions. I love math. But I think you’ve just explained why I hate biology. You’re right, Mary. I’d never thought of that, but the whole thing becomes meaningless if you can’t tell the colors apart. Probability, schmobability. That’s the kind of math that makes my eyes glaze over and a sliver of drool spill out the side of my mouth. However reading about it through your eyes has left me bright eyed and bushy tailed. Great read!! In nursing school, did you have to learn the connection between probability and possible drug interactions and side effects? Well when you put it that way I spend 12 hours a night worrying about the probability of drug side effects, the probability of a doctor coming when I need one, the probabiltiy of my patient making it through the night, and so much more. I guess I live and breath probability and didn’t even know it. I don’t know how you do it. You draw us into a space that is immediately familiar and then invite us along to share a memory like a private joke among friends. Well done. I often finish writing about some memory and find myself thinking, “Who’s going to care about this?” So thanks for saying that. Intriguing, Charles. I did a classroom observation today of a colleague who is a science teacher. She was teaching about the probability theory. What are the chances a baby would have blue eyes. As soon as she got into the recessive genes, I knew I was out of my league. She’d be impressed with your stats and rationalizations. You collected baseball cards. I collected Mad Magazine cards. 🙂 Enjoyed your post. There were Mad magazine cards? When was this? “Probability was a way to estimate how frequently a certain outcome would occur – not predict what would happen at any given moment” – I never thought about probability (or possibility) this way before, but it makes so much more sense when you put it that way. 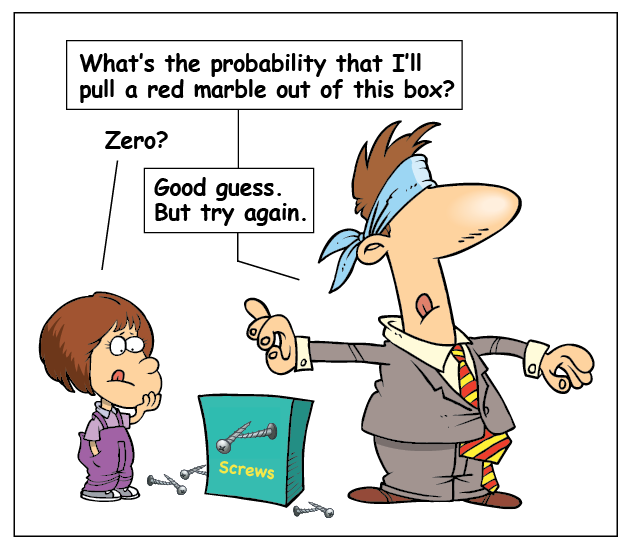 I think one of the ways we’re fooled by statistics is through our lack of understanding about probability. And as our lives become filled with more and more things to do, we have less time to examine information and really think it through. I’ve pretty much stopped listening to reports about the latest study or poll. I don’t have the time (or the brain power) to figure it out, and I don’t trust what we’re being told. Only you can write a post on probability in such a light hearted way Charles. Thank you, Kar. I’m glad you liked it. Suddenly the stock market makes more (non)sense now that I see them furiously trading baseball cards! When I was little, I used to hear the stock market reports at the end of the news, when they would say how many shares were traded that day. But I didn’t know the word shares, and thought they were saying chairs. For a long time, I pictured the stock market as a huge room with thousands of people all switching chairs. Actually, I still do. Substitute “craft materials” for “packs of cards,” and you just may have hit upon the malady shared by millions of us craftaholics–although a small percentage of us does try occasionally to make something exciting out of the supplies. What is the probability that I can become part of that small percentage? Great post, BronxBoy. Looking forward to Part 2! I’d say the probability is extremely high, Marie. I think the secret is to focus on one thing and do it better than anyone else — and find someone to promote you. Based upon the volume of baseball cards I lost when flipping them, I’d say certain kids had a well-developed technique which shot probabilities to hell! I lost a lot of cards that way, too, John. And the ones I didn’t lose, my mother threw away. So, I suppose the really good kids were counting cards. They’re probably cleaning up in Vegas right now. There has to be another explanation, Linda. My friends couldn’t count anything. Well, neither can I count anything. That’s why I don’t play cards and I don’t gamble. Oh dear. Are you telling me in all probability I won’t win the $222 million lottery drawing? Rats. In my non-math brain, probability goes out the window when dreams of winning big money take over. yes it is. And I have two probable winning tickets in my wallet! So as a practical application- if I as a pharmacist am talking to a patient and the patient says “What is the probability of getting my pain medication early?” and I say “One in zero,” will that rip a hole in the space-time continuum? Only if the patient is a math teacher. As a child I was always on the search for green marbles. They were my favourite. I would have been putting my hand in that bag repeatedly until I had all the green marbles. Baseball cards were seasonal? I had no idea. What on earth did you flip in the winter. We had the cards from previous years. And there were always comic books. 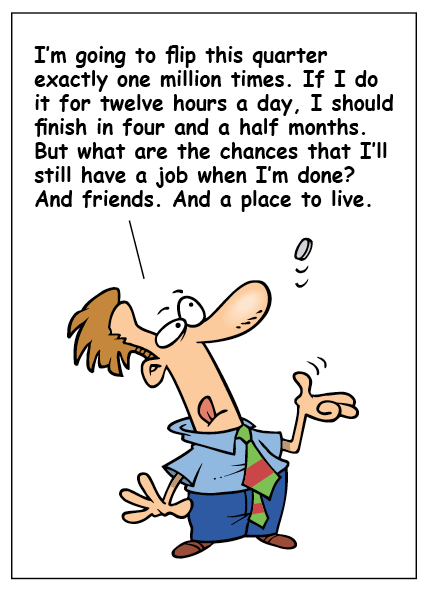 I loved math – but hated figuring probability. I suppose I like to take the occasional chance and just hope and believe the green marble will feel my need of it and roll into my palm. I don’t gamble, but I will buy a lottery ticket – quick pick usually. If the universe wants me to win, it will provide the winning numbers. That’s the romantic coming out in me I suppose. My son has a storage box full of baseball cards. If you don’t flip them, what on earth is left?? It’s hard to say, Renee. Things have changed since we were kids. I imagine there were a few forward-thinkers back then who anticipated that the cards would one day increase in value. I remember one older guy who kept his cards and comic books in plastic sleeves — this was in the mid-60s. We thought he was weird, but he’s probably rich now. Today, the market is flooded with the stuff, and there are so many collectors. I don’t think we’ll ever see the insane prices again, but maybe your son has a few cards in that storage box that will be in demand someday. Do kids still flip cards? One of the great questions is, “To what extent is the universe deterministic?” As you point out, there is nothing truly random about flipping a coin. If you knew all the factors involved, you could know exactly how the coin will fall. The problem is two-fold: the number of factors is extremely high and chaos mathematics applies to the calculation. Those two things make it practically impossible to actually do the necessary calculations. But in theory, most (if not all) physical events are fully deterministic and can, in theory, be calculated if you were capable of doing the calculations. Weather, for example, is fully determined and, in theory, whether it will rain in Poughkeepsie a year from now is currently determined. The crux of the question is whether the human mind has something special that takes it beyond mere determinism. If it doesn’t, the reality is that we are nothing more than machines acting out our lives on predetermined rails. We are nothing but clock mechanisms. Are we nothing more than that flipped penny? Are our thoughts as predetermined as that penny flip? We don’t know. Which is why the theory of alternative universes is so intriguing. Somewhere in an alternative universe there is an alternative me deciding not to reply to this comment. Or replying something completely different. Or robbing a liquor store. Multiple alternative universes take the pressure off decision making- right now someone is deciding to do what you just decided not to do. Multi-universe theories seek to get around the bizarre predictions of quantum theory. The idea is that, every time some (quantum) event can go both ways, it does go both ways, and this creates (in some sense) two universes. The impressive thing is that quantum events occur everywhere constantly in unimaginable numbers. The amount of universes being created is staggering. Very few physicists believe this actually happens; it’s almost more an accounting trick to try to deal with quantum weirdness. If our minds have some component of quantum theory operating, then it’s possible a quantum event affected your intent to reply or affected the content of said reply. If a multi-universe theory is correct (it probably isn’t), then there is a “universe” in which another “you” made a different decision. So in a Many Universe reality, there are various versions of “you” who had different lives. In some, the only difference might be your eye color or something insignificant. In others, your past might have been troubled and difficult, and you could be someone completely different. What makes these theories compelling to some is how difficult (if not impossible) they are to prove. Pretty much by definition these universes are out of our reach. HWT: Your comment illustrates the fact that an infinite number of universes would be necessary. The concept of infinity is a useful tool in math, but when you try to apply it to life in general, things tend to get messy. WS: I knew you were going to say that. It seems to me that determining the probability of an event happening requires enormous numbers of tests or subjects, like a medical study or a survey, in order to reduce the margin of error to as close to zero as possible. I’m thinking of the coin flip or gambling. In the normal scope of things, because of the number of tests required, knowing the probability is virtually useless unless the perpetrator wants to use the information (bend the statistics) to accomplish some less than altruistic purpose. Unfortunately, HW, most people these days don’t have time to really explore many of these claims, and they take the card the illusionist wants them to take. Are you saying that probability is now just smoke and mirrors? Illusion and confusion? No need for statisticians these days, just keep coming up with new reality TV shows. I think the economy, the internet and the power mongers are somehow melting us down and molding us into a flock of sheep. Sounds goofy, so I’ll stop right there. Thanks, Charles, for letting me spin out. Any time, HW. For what it’s worth, I don’t think we’ve been molded into a flock of sheep. I think we did that ourselves. I love this, and I can’t even explain why it warms my heart so much. For one thing, it’s encouraging to know someone (such as yourself) not only instinctively grasps concepts like probability, but latches on and makes it all work for him. I love the idea, but my brain will only delve so far into it before everything goes all fuzzy and my equilibrium jitters off into the ever-present darkness. You da’ man, Charles — I gladly defer to you in matters of math. I mean, nearly another entire day has passed without my having utilized algebra even once, and all is well. Are you saying you can get through a whole day without using the square root of a negative number? Judy, how are you doing it? Thanks, Uncle Phin. I hope Part 2 wasn’t a disappointment. As someone mentioned in the comments above, probability is really a frequency concept. If I flip a coin enough times and look at , I should get closer and closer to what we call “the probability” of tossing a head. Things get even weirder conceptually when one looks at continuous situations. What is the probability of hitting a particular point on a dart board? There are overwhelmingly number of points on the dart board (infinitely many actually), so the probability should be zero of hitting any particular point. Yet the dart arrow is there on the board, have you just done something impossible? Just because an event has probability 0 does not mean it cannot happen. The same is true for an event that has probability 1, it does not need to happen. Probabilists usually say that an event of probability 1 must “almost surely happen” as opposed to “surely happen”. I do address this idea in Part 3, with the sequence of shuffled playing cards. It’s especially confusing when the probability of any particular thing happening is close to zero, but one of them has to happen. And it’s me with office supplies. Do you need paper clips? Staples? Paper? What’s the probability of two guys moving to Canada in the same year to two different provinces, having a family member work in the school system, especially when one never planned to work in the school system, and both agree that their respective relative should meet the other, and have the same interest in writing, meet a third person who likewise has similar interests, who also moved to PEI the same year I did, and then meet on Tuesday night to discuss the probability of getting published? I think that made sense, but if not then what is the probability that anyone would? Are you kidding? How could all of that not happen? According to the Rules of Narrative Adventure Fiction, “million-to-one” chances pay off nine times out of ten. Well-known fact. It’s when I get a serious case of the, “Yeah, buts!” that I can get completely thrown out of the movie’s mood. It’s good that so many of them are based on comics, since that’s exactly what they’ve become: cartoons. I’m reminded of all the impossible stunts and mayhem that occurred in our childhood Saturday Morning Cartoons. Abe Lincoln: Vampire Hunter… not that different. Same mayhem, but now it comes with Authentic Gore™ and Photo-Realistical 3D ® and five-channel Surround Sound ©. That was a very interesting post! A lot to ponder over. You have a unique writing style gripping the reader. Thank you! You made my day! Ann Marie. Thank you, Ann Marie. I appreciate that you took the time to read my post, and leave a comment. always welcome. have a great new week! This is such a fascinating subject, and you certainly discussed it in the most interesting way. Although I always found the subject of probability appealing to study I never did well on the exams, so I guess I’d rather listen to it or read about it than be tested on my knowledge and understanding. Baseball cards were a large part of my living with a brother. The female version of baseball cards was trading cards, which I greatly valued. Do you remember those? They covered many subjects, and we would try to collect ones that pictured subjects appealing to us, and trade the others. I guess baseball cards were a subset of the larger category of trading cards. But we focused on the baseball version and all but ignored the rest.